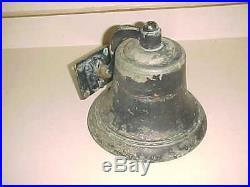 This vintage WWII era bronze or brass ships bell is 7 tall. 9 across at the bottom and weighs 16 POUNDS. ROWE near the top I could not find any other markings [I had a difficult time getting a clear pic of the signature but be assured it is bold and crisp]. Circa Mid-Century there was a Fletcher class destroyer, the USS ROWE, but I have no idea if it is related. More than just a pretty picture. The item "NAVY BRONZE or BRASS SHIPS BELL Signed W ROWE 16 POUNDS" is in sale since Monday, November 20, 2017. This item is in the category "Antiques\Maritime\Bells & Whistles". The seller is "artz9" and is located in Camp Hill, Pennsylvania. This item can be shipped to United States, Canada, United Kingdom, Denmark, Romania, Slovakia, Bulgaria, Czech republic, Finland, Hungary, Latvia, Lithuania, Malta, Estonia, Australia, Greece, Portugal, Cyprus, Slovenia, Japan, Sweden, South Korea, Indonesia, Taiwan, South africa, Belgium, France, Hong Kong, Ireland, Netherlands, Poland, Spain, Italy, Germany, Austria, Israel, Mexico, New Zealand, Philippines, Singapore, Norway, Saudi arabia, Ukraine, United arab emirates, Qatar, Kuwait, Bahrain, Croatia, Malaysia, Chile, Colombia, Costa rica, Panama, Trinidad and tobago, Guatemala, Honduras, Jamaica.